Nurse Practitioner Registration is required only once. Registration does not confer the authority to practice as a Nurse Practitioner in North Carolina. If you wish to practice as a Nurse Practitioner in North Carolina, in addition to one-time Registration, you must also complete an Initial Approval to Practice application. The Certificate of Registration will be emailed to you once all documents have been received and the application has been processed. In order to practice as a Nurse Practitioner (NP), a Registered Nurse (RN) must obtain Nurse Practitioner Registration and Approval to Practice with their collaborating/supervising Physician. The Certificate of Registration will be emailed to you once all documents have been received and the application has been processed. The one-time Registration does not allow you to practice as a Nurse Practitioner in North Carolina; the Initial Approval to Practice application must also be reviewed and approved. Initial Approval to Practice applications are reviewed and approved jointly by the North Carolina Board of Nursing and the North Carolina Medical Board. The Nurse Practitioner shall not practice until notification of approval to practice has been received from the Board of Nursing. The approval letter will be emailed to you upon FINAL approval to practice. Indicate the correct status of your position as either Volunteer or Non-Volunteer for each approval. "Approval to Practice" means authorization by the Medical Board and the Board of Nursing for a Nurse Practitioner to perform medical acts within her or his area of educational preparation and certification under a Collaborative Practice Agreement with a licensed Physician. This application is for the Nurse Practitioner applying for approval to practice for the first time in North Carolina who has already been issued Nurse Practitioner registration or has submitted the Nurse Practitioner Registration application. The Nurse Practitioner shall not practice until notification of approval to practice has been received from the Board of Nursing. The approval letter and certificate will be emailed to you upon FINAL approval to practice. This application is for the Nurse Practitioner adding a new supervising Physician. This application is for the Nurse Practitioner removing an existing approved supervising Physician. This application is for the Nurse Practitioner updating practice information (Name, Address, Office Phone, Fax, Email) for an existing approved supervising physician. In order to renew your approval to practice, your current approval must be within 90 days of the expiration date. If your Registered Nurse license is also due to be renewed in the same year, you must renew your Registered Nurse license before you can renew your Nurse Practitioner approval to practice. In order to practice as Nurse Practitioner, in addition to renewing the Nurse Practitioner approval, a Registered Nurse license valid for practice in North Carolina, must also be maintained. This application is for the Nurse Practitioner applying for renewal of approval to practice. A Nurse Practitioner with an inactive approval to practice status shall not practice as a Nurse Practitioner. Prior to practicing, you will be required to reapply for approval to practice and will need to complete the Approval to Practice Reinstatement application. Maintaining certification as a Nurse Practitioner by a National Credentialing Body (ANCC, AANP, AACN, PNCB, NCC) is also required. 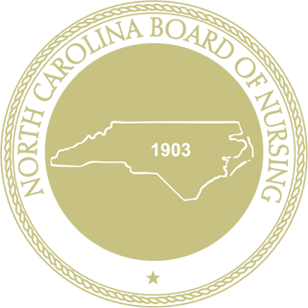 If you have renewed/updated your National Nurse Practitioner Certification since your last renewal, provide an updated copy to the North Carolina Board of Nursing. In order to practice as Nurse Practitioner, in addition to reinstating the Nurse Practitioner approval, a Registered Nurse license valid for practice in North Carolina, must also be maintained. This application is for the Nurse Practitioner applying for reinstatement of approval to practice. This application is for the Nurse Practitioner requesting inactive status for ALL supervising Physicians. This application is for the Nurse Practitioner to submit additional practice sites to your currently approved practice(s). This application is for the Nurse Practitioner to update/change the Registered Nurse information in the North Carolina Board of Nursing's records for another Compact State license. Once the application is submitted, we will verify the information with the Compact State. If North Carolina is now your primary state of residence, you must apply for a North Carolina Registered Nurse license. Per 21 NCAC 36.0702(2), a nurse changing primary state of residence from one Compact State to another may practice in the new home state (new primary state of residence) with the prior home state’s license, for a period not to exceed 90 days.